Off to the Otways i headed - Blanket Bay to be precise in the heart of the Great Otway National Park. I always try to get away once a year on a solo camping trip to indulge my creativity and dedicate myself 24/7 to photography. I try not to have any expectations or plans. My aim is to simply follow my instincts and what i photograph will be of an intuitive nature. I photograph at all hours wandering around in the middle of the night and day. Following my nose and having a constant dialogue with myself about art, what i am seeing and what i am feeling I am able to listen to thoughts that are normally squashed deep down under the commitments and pressures of modern day living. Its a great exercise and is constantly surprising. It was going to be a great night but i didn't realise just how unique it was gong to be. The night turned to black - it really is amazing just how dark a night is when you are miles from any light source, it never fails to impress. I set my camera up on my tripod and pointed my camera at the now beautiful, mystical Milky Way. To the south not far along the horizon i noticed a greenish yellow tinge in the sky and just assumed i was seing the lights reflected in the sky of a distant city like Warnambool. However after my first 50 second exposure I realised that there were magenta's as well as yellows in the frame! Our cameras can see far more than our naked eye when allowed to expose for a great length of time. However i was convinced my lens was playing up, maybe catching some flare off something but what! I gave it a good clean and after exposing another image for 50 odd seconds the same thing occurred. 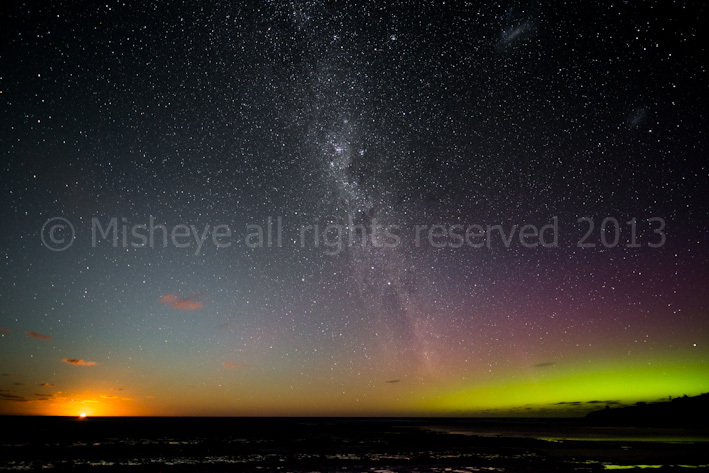 Could it be that I was witnessing the Southern Lights - the illusive Aurora Australis? Well yes it was - how lucky am I! It is something you can't really plan for and is quite rare to be seen from mainland Australia.